A decaffeinated dark-roasted coffee with smooth, yet juicy, mild coffee notes, roasted flavors, and Arabica notes. Add cream and sugar to taste. 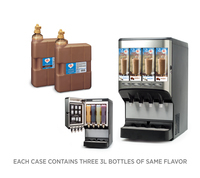 For a more gourmet flavored coffee, add one of our COFFEE-MATE creamers such as French Vanilla or Irish Sweet Cream.